When it comes to buying a property for the first time there’s excitement and stress associated with decisions that come along the way. 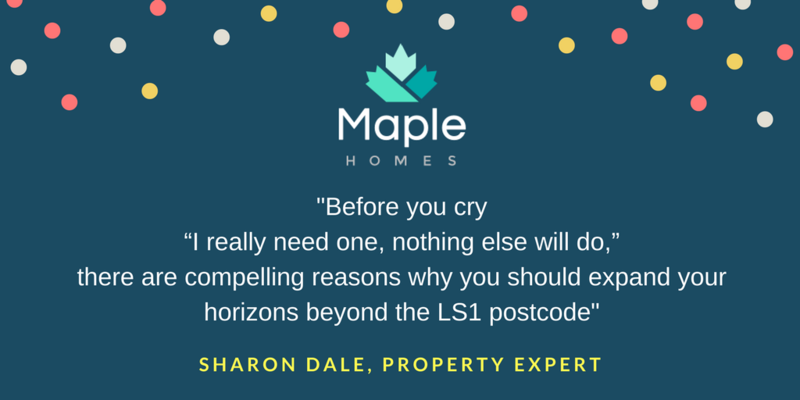 We asked Sharon Dale, a property specialist who writes for the Yorkshire Post and ‘Gorgeous Yorkshire’ for some advice on buying in Leeds. With big dreams and small budgets, life as a first-time buyer can be a series of disappointments if you don’t “get real”. This is especially true in Leeds. It is one of Britain’s most economically vibrant and exciting cities, so top of the wish-list for many first-timers is a city centre apartment – and it’s easy to see why. These flats are fashionable and your friends will be jealous if you buy one, they are within walking distance of work, bars, restaurants and shops and you can get super-fast Deliveroo from Leeds Trinity Kitchen. Properties a mile or two outside the city centre offer a lot more bang for your buck. You can buy a brand new house with parking and a garden for the price of a second-hand apartment and there won’t be a monthly service charge to pay. Check new developments out, look at the layout and the square footage and assess how quick and easy it is to get into central Leeds. LS10, the Hunslet, Beeston and Belle Isle area, is proving very popular with first-time buyers. In fact, it’s in the top ten UK places where first-time buyers are snapping up most homes, according to research by Hamptons. Half of all sales were to first-timers, which points to an area that is up-and-coming. Buyers here will also benefit from the forthcoming £350m regeneration of Leeds’ South Bank that will connect into the city centre. You don’t get much square footage for your money in the city centre and especially not in the best buildings. The average studio – one small room with a separate shower room – is about £100,000. One-bedroom flats start from about £150,000, although in prime locations, such as Granary Wharf, that price jumps to £170,000. Two-bedroom flats start from an average of £180,000. You may not get a parking space with your apartment so owning a car may be out of the question. It’s a fact that young people eventually tire of city living. Within three or four years, they start thinking about how nice it would be to have their own front door, a garden and more space. Most then move out to the suburbs. If you decide to move you’ll have two lots of buying/selling costs in quick succession. Do the sums and think of the future. Choice is very limited in the city centre as you are fishing in a small pond and this is compounded by a supply and demand issue in central Leeds. There is very little for sale or rent. This also inflates prices. If you buy a flat, you won’t just have a mortgage to pay. You’ll also have a monthly service charge, which could be from £50 to £100 a month. As most apartments are leasehold, you’ll also have ground rent, which could be anything from £25 to £50 a month upwards. If you buy a newly-built property, you may be able to take advantage of the Help to Buy equity loan scheme. This means the Government lends you up to 20 per cent of the cost, interest free for five years. So you only need a five per cent deposit and a 75 per cent mortgage. In conclusion, think with your head first and your heart second, Explore all the options. A spacious newly-built home within 10 minutes of Leeds city centre is well worth checking out before you commit to the biggest purchase of your life.